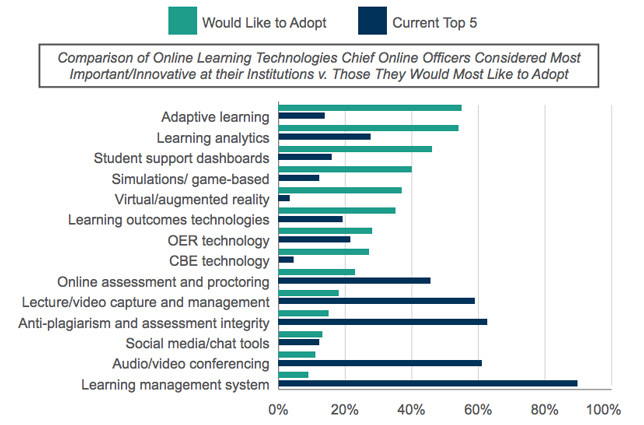 When asked what tools and technologies they would most like to adopt for their online programs, online education leaders cited adaptive learning and learning analytics as their most wanted tech, according to a recent survey. The second annual Changing Landscape of Online Education (CHLOE 2) report, a joint initiative of nonprofit Quality Matters and Eduventures Research, the research and advisory services division of the National Research Center for College & University Admissions, surveyed 182 chief online officers (COOs) at U.S. colleges and universities about policies, practices and plans around online education. Researchers defined "chief online officer" as any position that manages online education for an institution — with responsibilities spanning course and program development, training, technology selection, support and oversight, budgeting, quality assurance, planning and policy. Rounding out the top five technologies on COOs' wish lists: student support dashboards, simulations/game-based tech and virtual/augmented reality. The report singled out learning analytics and adaptive learning as the most likely tech to reach mainstream adoption in the near future, based on their current adoption and interest levels. The technologies currently in use by online programs were decidedly less cutting-edge. The top five most important technologies used for online learning today, COOs said, are the learning management system (the clear leader, cited by the vast majority of respondents), anti-plagiarism and assessment integrity tools, audio/video conferencing, lecture/video capture and management, and online assessment and proctoring. 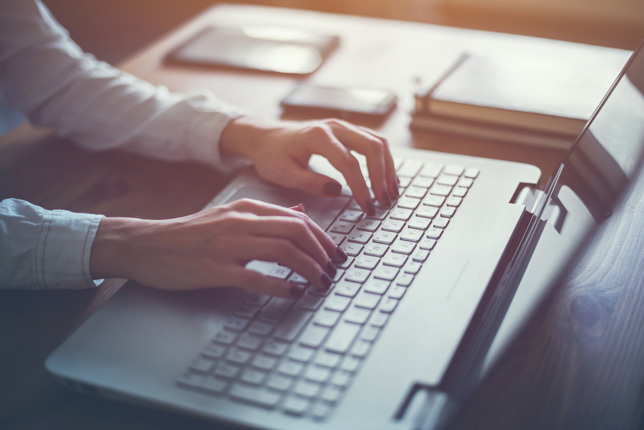 "The LMS is not simply a tool in its own right but increasingly a platform that hosts and integrates an open-ended array of other tools," the report noted. Half of the survey respondents have seen or foresee major technology change for their fully online programs. The most commonly cited motive for that change: improving the student experience and student success. Other top factors included improving the faculty experience, overcoming the limitations of current technology, and experimenting with new solutions. The least-cited reasons for technology change: standing out in a crowded market and keeping up with competition. "It is striking that schools engaged with a modality defined by breaking campus norms are not particularly worried about technological innovation as a force of competition, and few see such innovation as a way to stand out from the crowd," the report said. "This speaks to the relative absence of online program competition on explicitly technological or pedagogical grounds. Schools tend to compete on convenience, flexibility, and program relevance; as well as on conventional notions of institutional or programmatic prestige."